Welcome to day 1 of the Sweet ‘n Sassy September feature Blog Hops! For the Christmas wreath, I made my cardfront to look like a door. The background and each layer were stamped with the woodgrain image from Grunge Borders. 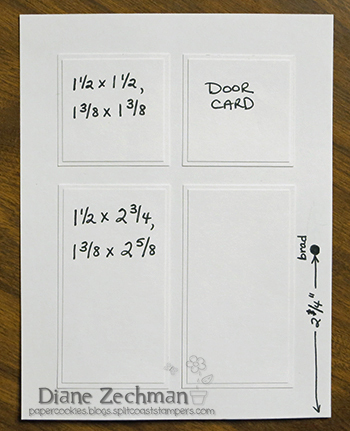 I saved the measurements that I used for the panels, so here’s a pic in case you would like to make one too. The card base is A2 size. The Easter wreath was simply colored and popped up. Check out more samples made by our DT on the Sweet ‘n Sassy blog. Be sure to leave a comment on each of the blogs along your journey because YOU could be a lucky winner! We’re giving away (6) $15 store credits (1 winner will be chosen from each of the 6 blog hops). The deadline to comment for a chance to win is midnight EST Friday, September 13th. The list of winners will be announced on our website homepage by Monday, September 16th. 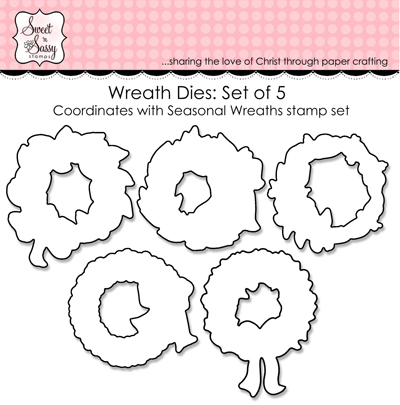 Christmas card: stamps- SNSS Seasonal Wreaths and Grunge Borders; paper- SU! Crumb Cake; ink- SU! Crumb Cake; accessories- Copics, Stickles, brad. 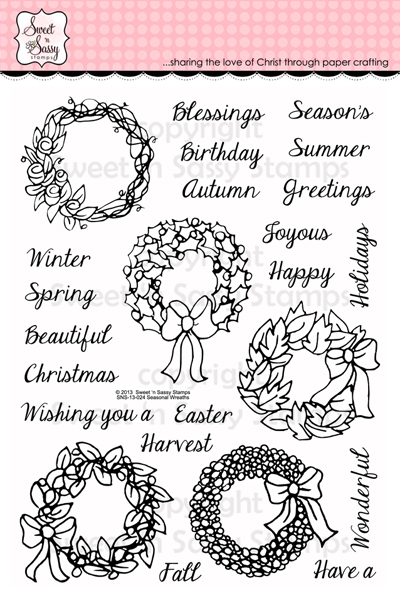 Easter card: stamps- SNSS Seasonal Wreaths; paper- white; ink- Memento Tuxedo Black, SU! Pixie Pink; accessories- Copics, Spellbinders Wonky Rectangles, foam tape, adhesive pearls. This entry was posted in cards, etc., CAS (clean & simple), Christmas, Sweet 'n Sassy, tutorials and templates. Bookmark the permalink. I love the wood grain door Diane, you are so clever. Thanks for sharing the dimensions of the door front.. I love how you made the card! I wasn’t going to get this set, but now I might have to! FAbulous cards. Love the door you made. Love that door with the wreath!! Very clever design. Two gorgeous CAS cards that really let those stunning wreaths shine! LOVE that door card, it’s awesome! Both cards are beautiful, Diane! 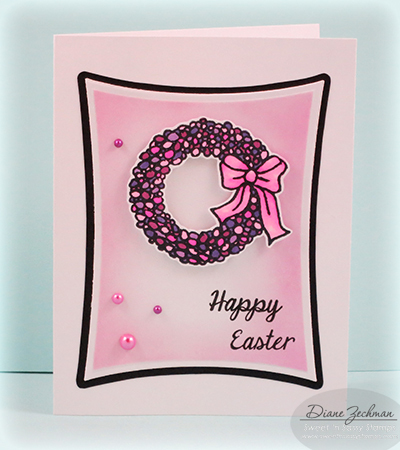 Love the pink Easter card and the perfect placement of the pearls! Love the woodgrain door and thank you for giving the measurements. The pink Easter wreath is adorable. I love your cards, the door is neat! Thanks for sharing. Great cards Diane. Love the door one and the Easter one looks divine! Diane, we’re neighbours – you live at the house with the brown door and I live at the house with the white door! 🙂 Love your card and your detailed instructions – you are one of the most helpful and inspiring stampers, always enabling the rest of us with your creative ideas – thank you! I love how this stamp set is so versatile! Diane, your door card is so creative and beautiful…thank you so much for sharing your directions! Love the colors of your Easter card with the black…the colors really pop! I used this same wreath for a Christmas card proving how versatile this set is! Hugs! Fun cards! I enjoyed seeing the pink Easter card! Thanks for posting the measurements for the door. Fabulous projects. I just love that door. Thanks for the directions. Cute idea making a door for the wreath! Nice Easter card, thanks for showing the versatility of this set! 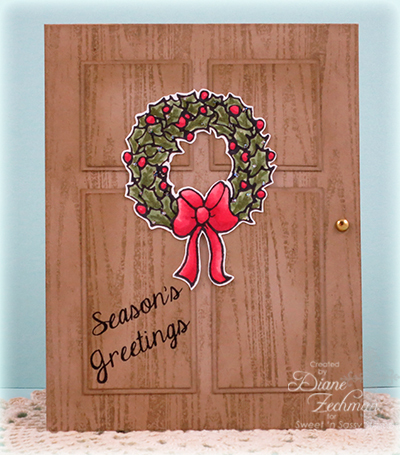 Very nice cards…love how you made the realistic door (thanks for the pic tutorial). Beautiful cards Diane. Love the Easter one with the soft sponging and the random pearls… and oh, that door with the wreath… just perfect. Thanks for the measurements! Your cards are great! Thanks for sharing your door directions. Love your Easter card too. Diane, these cares are just adorable ~ especially that “pink” Easter wreath *giggle* Great inspiration gal! oh wow…I love the door!! It steals the show! Wonderful door! Thanks for sharing the dimensions! I love the door. Very good concept. What a fun door card!!! Great idea!! Thanks for the measurements! Thanks for the directions on the door card – It is very cute and I would like to try it – your coloring is fabulous on both cards! Thanks for the inspiration! What a wonderful Easter card just love the colors. Glad you posted your instruction for the door.